The plan which is colored differently is your existing subscription. 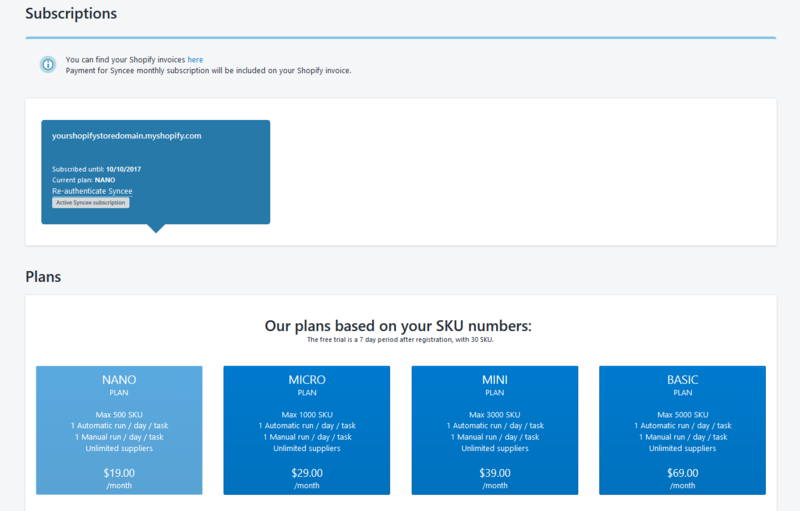 If you would like to choose another plan, just click on your new choice. It will activate immediately, so just lean back and enjoy your new Syncee subscription right away. Shopify will charge the credit card that is added to your Shopify account. Adding Credit Card is not required in your Syncee account. You are paying directly to Shopify, not Syncee, so please turn to their support staff with financial issues. Each shop can have only one recurring charge per app. When a new subscription is activated for a shop that already has one, the existing subscription is cancelled and replaced by the new charge. The new recurring charge is then activated. You can find more detailed information about our pricing plans here.